SurgaColl, a spin-out of the Royal College of Surgeons in Ireland (RCSI), has closed a €2 million syndicated investment round involving AIB Seed Capital Fund, Harmac Medical Products, Enterprise Ireland and a number of private investors in Britain, France and Singapore. The AIB Seed Capital Fund, co-managed by Enterprise Equity Venture Capital, has completed a €500,000 equity investment in SurgaColl. A tissue regeneration company based in the Rubicon Centre in Cork Institute of Technology, SurgaColl will use the funding to commercialise breakthrough tissue regeneration technology developed by the RCSI. The multimillion-euro investment coincides with the licensing by SurgaColl Technologies of breakthrough RCSI technologies for the regeneration of human tissue. 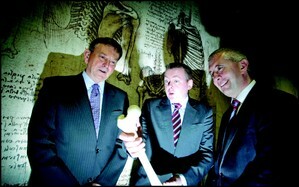 The company was established in 2010 with VC backing to commercialise implantable orthopeadic products developed by RCSI’s Tissue Engineering Research Group. The products use naturally derived materials for the regeneration of human tissue, including bone and cartilage. “This investment reflects the confidence of our investors in the company and in its collagen-based platform technology. “The funding will enable the company to launch its first product, HydroxyColl – an osteoinductive bone graft substitute – in the global orthopaedics market and to complete pre-clinical trials of a very promising cartilage regeneration product, ChondroColl,” said Dan Philpott, chief executive and co-founder of SurgaColl Technologies. The Royal College of Surgeons in Ireland is a not-for-profit organisation dedicated to improving human health through education, research and service. Founded in 1784, originally to train surgeons, it provides education and training in the healthcare professions at both undergraduate and postgraduate level. “The college is delighted to have completed the execution of intellectual property licence agreements and the set-up of a new Irish technology company, SurgaColl Technologies,” said Dr Gearóid Tuohy, director, RCSI Technology Transfer Office. Enterprise Equity Venture Capital jointly manages the AIB Seed Capital Fund of €53 million on a nationwide basis. The fund was established in 2007 and invests in start-up and early-stage companies or enterprises based in Ireland, which have high growth potential. The fund’s limited partners are AIB Bank and Enterprise Ireland. The fund invests in companies operating in all areas of technology, as well as medical devices and medtech.